The inaugural inductees into the BA Athletic Hall of Fame were an accomplished group both during and after their years at BA! Their stories and stats, told by selection committee chair Scott Huebel, kept the audience captivated, and there were more than a few ooh’s and aah’s, and even a few tears. 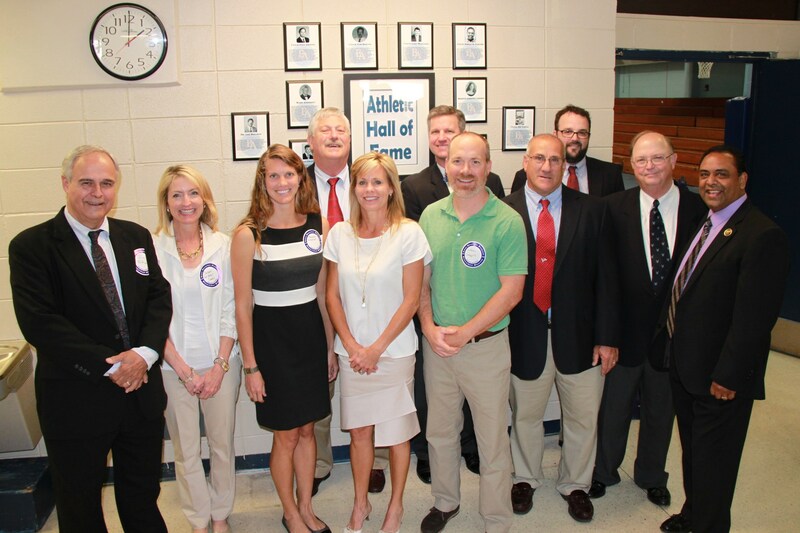 Click here to view additional pictures from the induction ceremony! With a total of 48 state championships in our 50 year history, it goes without saying that BA has had some talented student-athletes and coaches. This group played or coached on many of those teams, held numerous school records, served as team captains, led by example through hard work and dedication, loved their school, and made a lasting impact on the BA fields and courts. Sitting in the audience, you knew you were part of something special as you learned more about each of the inductees as they took the “hof seat”. It was also evident by the BA family and friends that were in the audience – numerous former faculty and staff, alumni, alumni parents, and of course the spouses and families of the inducted coaches and athletes. You were reminded that BA is not just a school; it’s a community, and a family. Congratulations to each of our inductees! Thank you for each of your contributions to BA athletics. Please contact Shannon Roberts at 843-524-3393 or sroberts@beaufortacademy.org, with any questions. The Beaufort Academy Athletic Hall of Fame is established for the purpose of recognizing and appropriately honoring achievements of individuals who have made outstanding contributions to the athletic programs of Beaufort Academy. A candidate for selection into the Hall of Fame as an athlete will not be considered until the student has been out of high school for at least 5 years. At a minimum, the student must have been a varsity athlete in his or her sport or sports and be an Alumnus. The committee will consider: awards, records established, championships and individual statistics. The committee will also consider the athlete’s college career including recognition for achievements and awards obtained there. Professional achievements in athletics may also be considered when determining Hall of Fame status (this may include coaching as well). It is also important that the committee consider the athlete’s overall contribution to his or her sport(s) during high school and beyond and to carefully weigh both high school achievements and overall achievements as a measure of overall success. A candidate must have been a coach and/or athletic administrator at Beaufort Academy for at least five (5) years and retired or otherwise left the school at least five (5) years prior to nomination. The committee will consider the coaches overall records, championships and number of years service to the program. The committee may also consider any other contributions the coach has made to help develop and foster athletics at Beaufort Academy. The Hall of Fame Committee will be responsible for soliciting nominations from as many sources as possible in order to ensure a fair and equitable consideration of all potential Hall of Fame candidates. Please note that all nominations will be confidential.